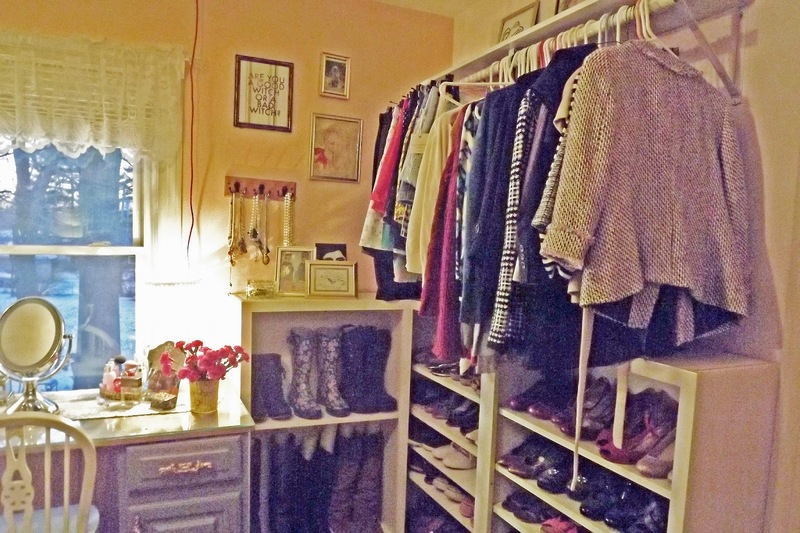 I just wanted to share with you a quick tour of my dressing room. 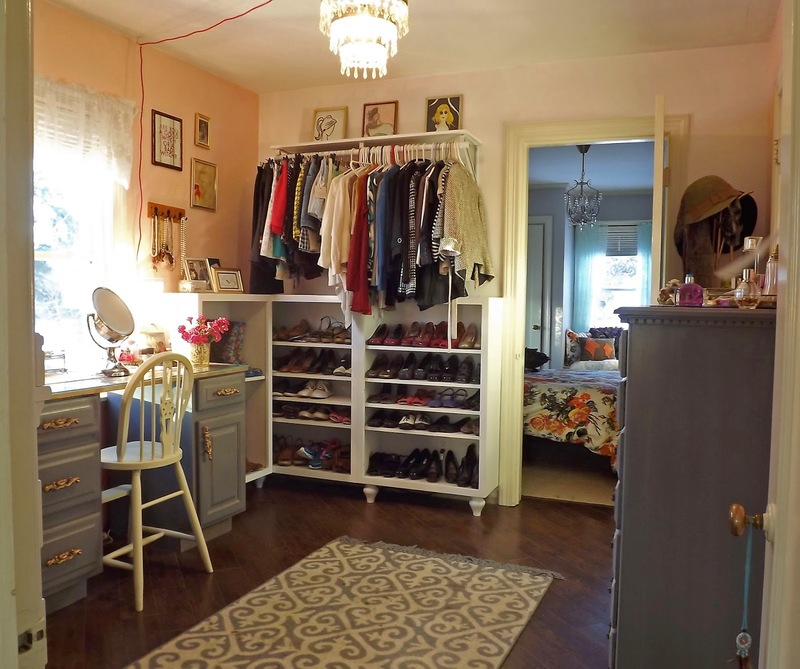 Everything in this room was done with bargains, creativity, and lots of love. 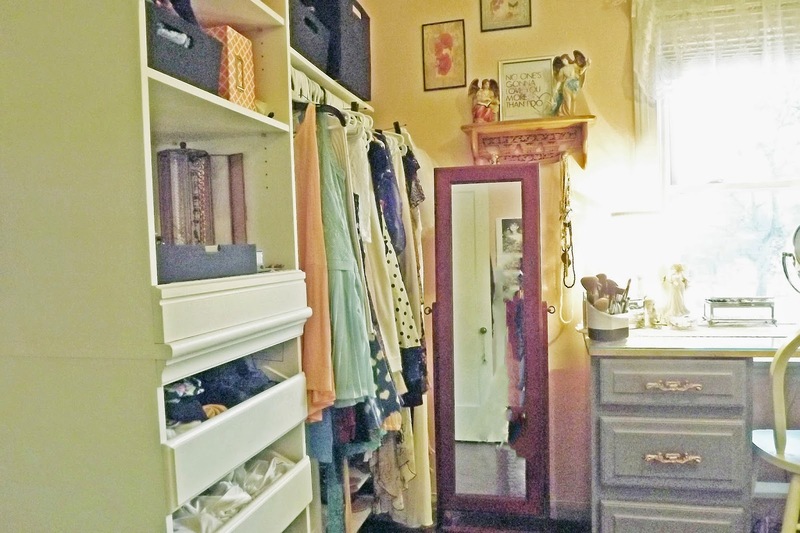 These two bedrooms (the dressing room and the master) were previously separated. However, when we moved the kitchen, we had to close in the second door to the master to make extra space for the fridge and a pantry. 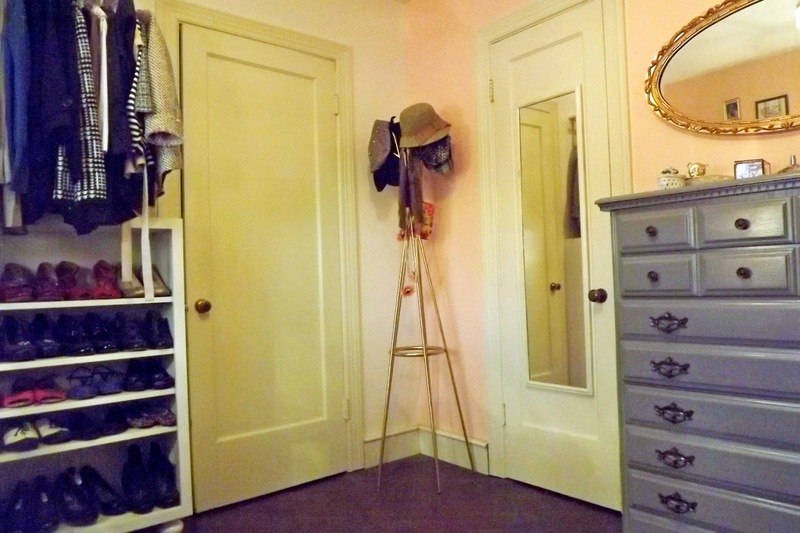 So this walk through bedroom made the perfect space for a dressing room. The east and west walls are pained in a pretty coral color. 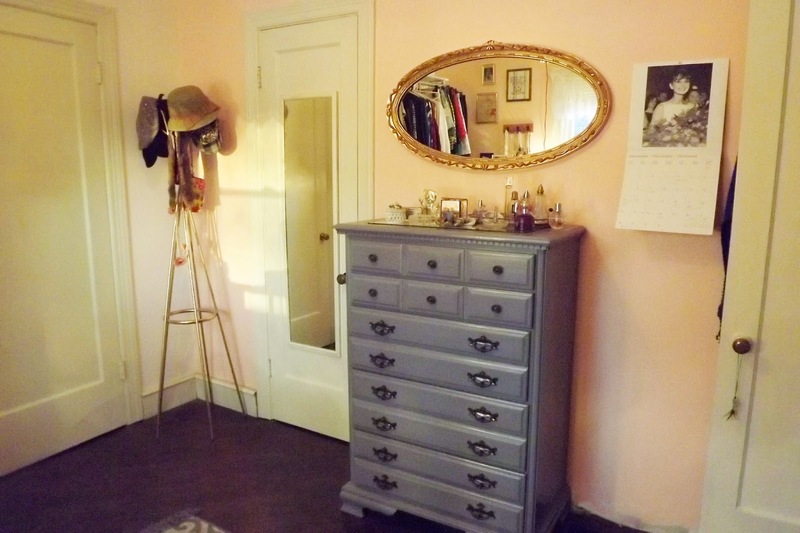 The two opposite walls are the same color, but several shades lighter to elongate the room. 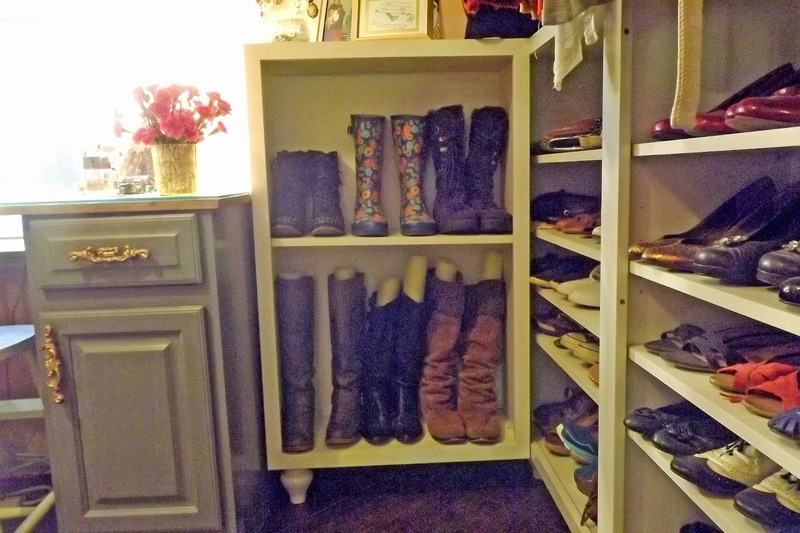 I also used as much vertical space as possible, not only for storage purposes, but to give the appearance of height in the room as well. This rug is from TJ Maxx and pulls in the color of the trim, as well as my chair, vanity, and dresser. I used gold as an accent color, which I think really dresses up the room. This old coat rack used to be neon green, and the mirror was about 4 different colors. 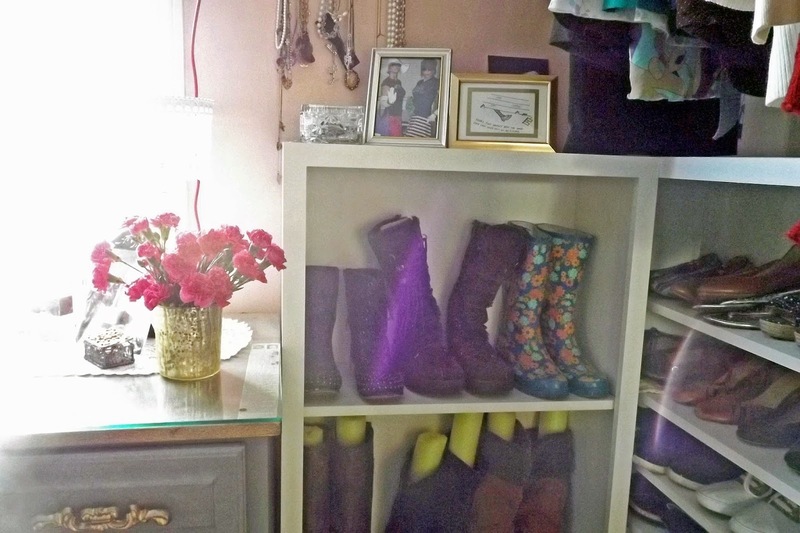 This drawer unit was from Menards, and then I added a couple of cheaper cabinets and shelves from Target. These are ALLLLL my dresses. I can't help it, I'm a girly girl. Sometimes. 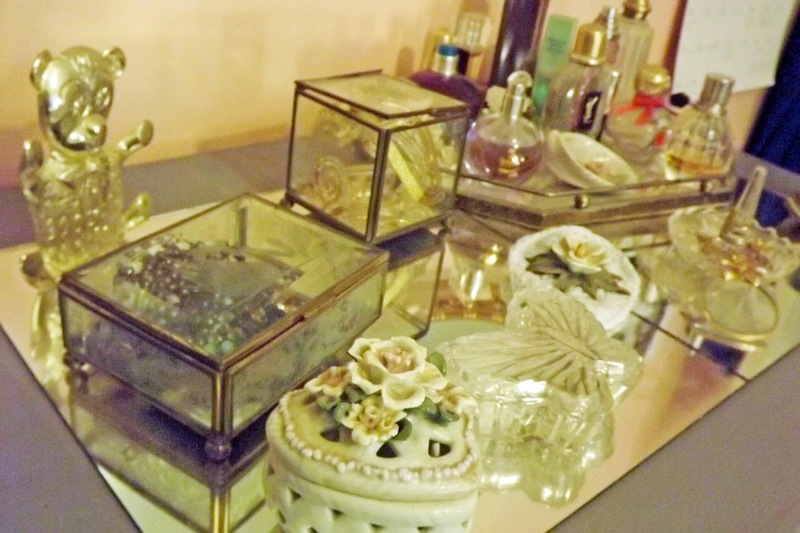 I also have tons of jewelry and this mirror doubles as a jewelry cabinet. 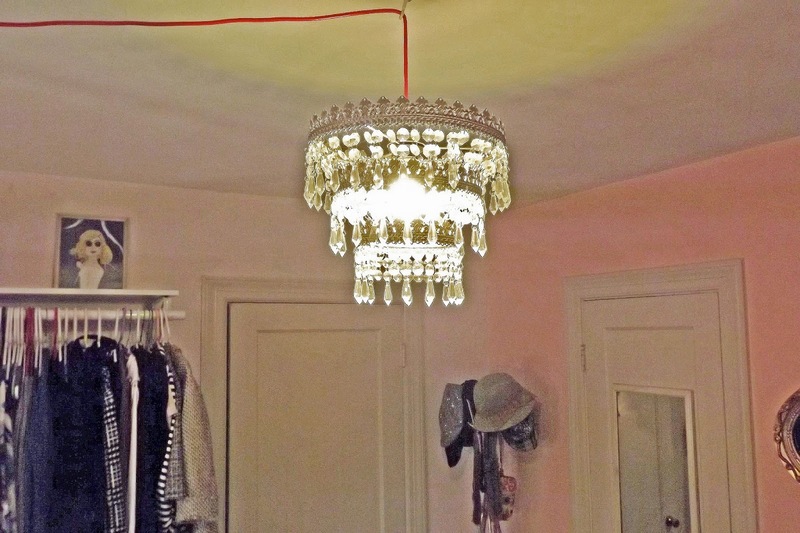 It reflects light which again, makes the room appear larger, as well as being multifunctional. 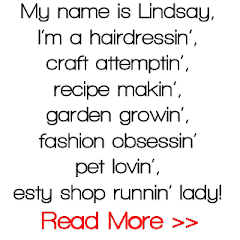 I love to add personal touches to a room to make it scream "Lindsay." This is a print my husband did for me from one of our favorite songs. 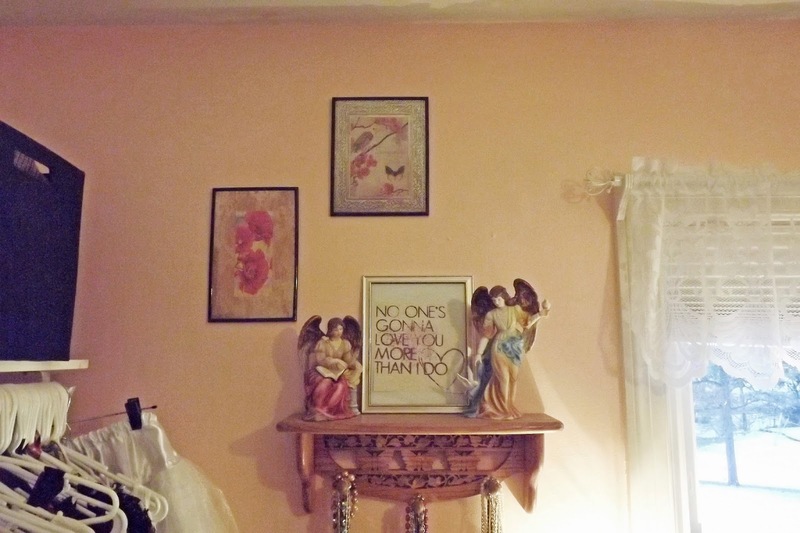 Plus, my beautiful angels, my butterfly shelf which holds necklaces, and some pretty prints from the Dollar tree. 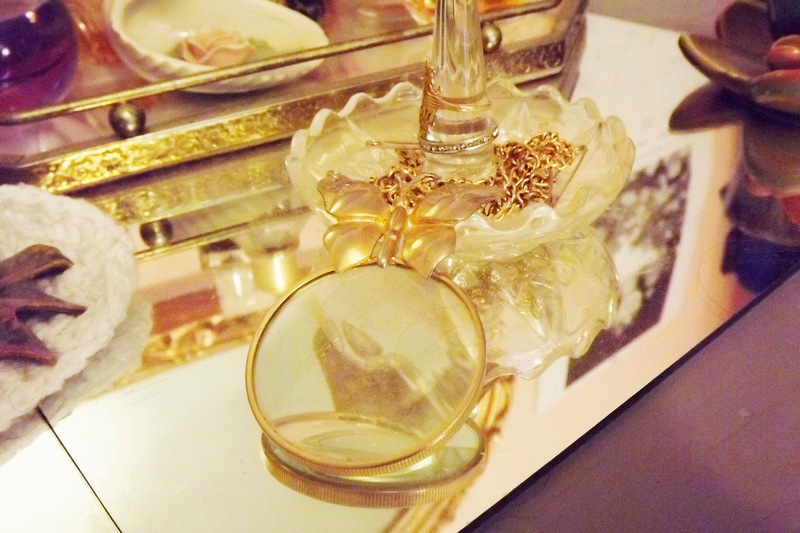 I used a light, lacy valence that was my grandma's to keep the girly/vintage vibe. I've had this vanity since I was in high school. My grandpa made it for me out of base kitchen cabinets. 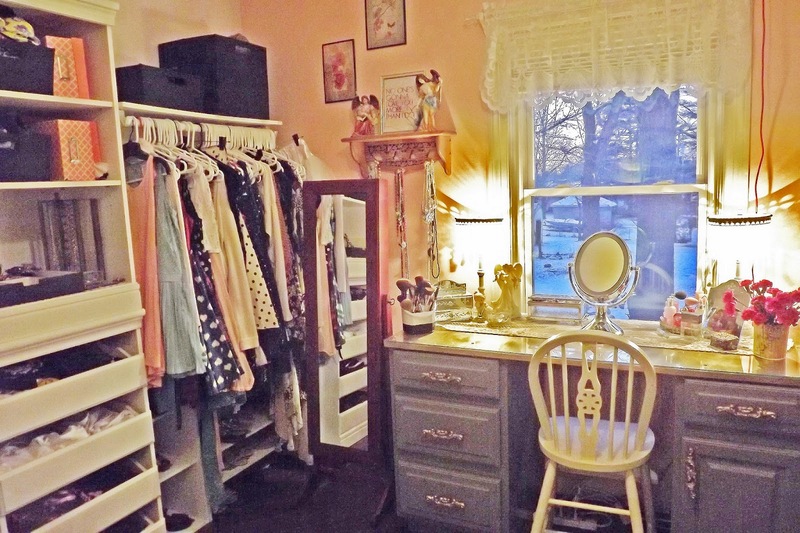 Its stocked full of makeup and hair products and accessories. 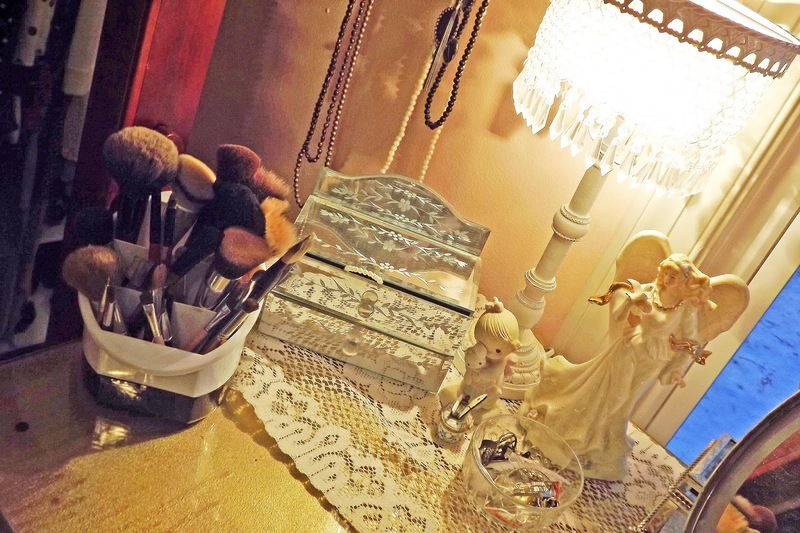 I used one of my grandma's crocheted table scarfs for the top of the vanity and lots of pretty little boxes for jewelry, pins, and hair accessories. The lamps were a 50% off clearance price from Hobby Lobby that reminded me of the roaring twenties! 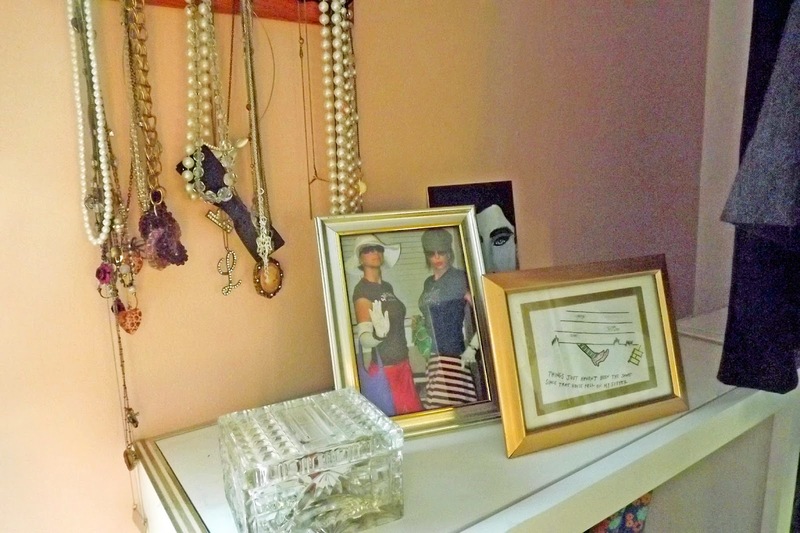 I've got lots of little trinkets and photographs, and art that people have made for me, so they are displayed in little vignettes around the room, mixed in with pearls and glass boxes. 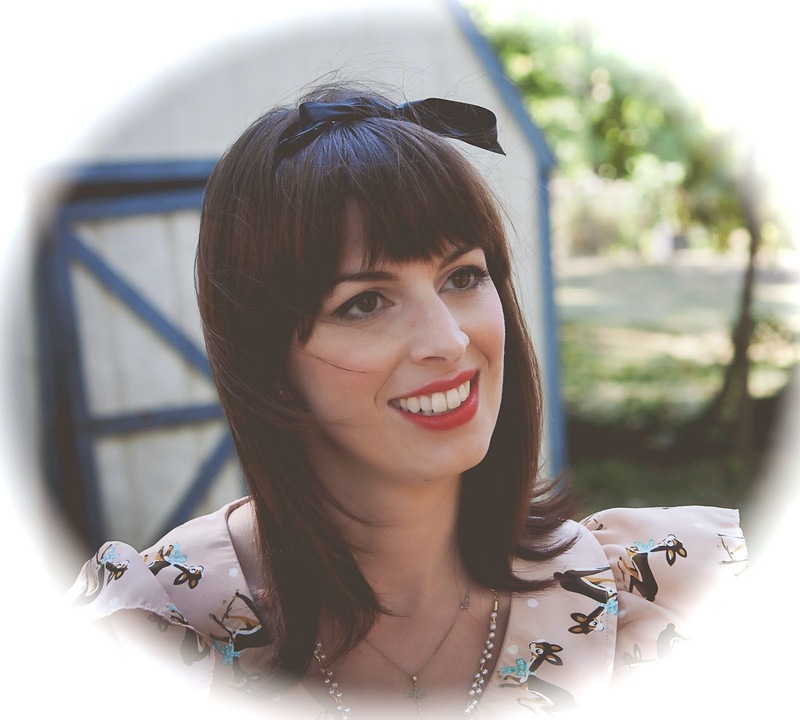 Because pearls and pretty things are considered art in my world, and I like to see them all. 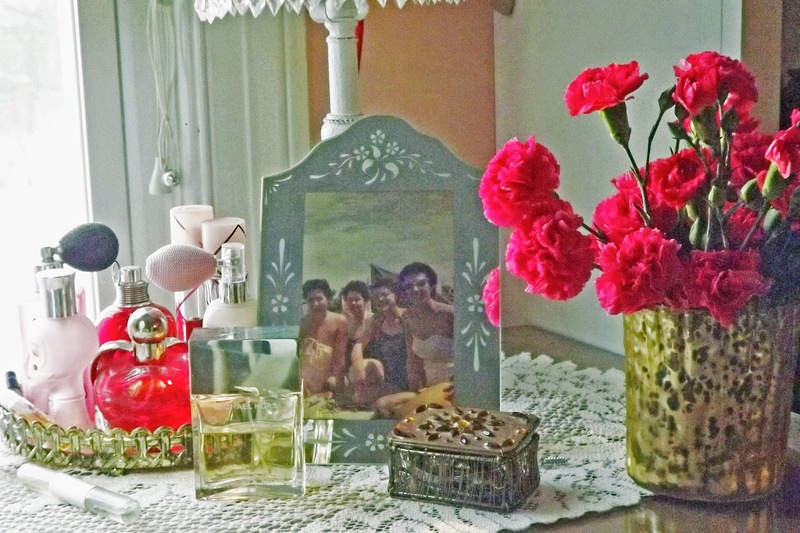 I love to group pretty perfume bottles together on a mirror, and this photo of my grandma and her sisters in their sunglasses and bathing suits reminds me of my sister and my friends and I now. I used a tiered pencil holder from the dollar bin at Target for easy access to my makeup brushes, and use little glass dishes to catch everyday things. These shoe cabinets were installed by my grandpa who took kitchen wall cabinets, removed the doors and painted the insides. I have been wearing many more of my shoes now that I can actually see them all! 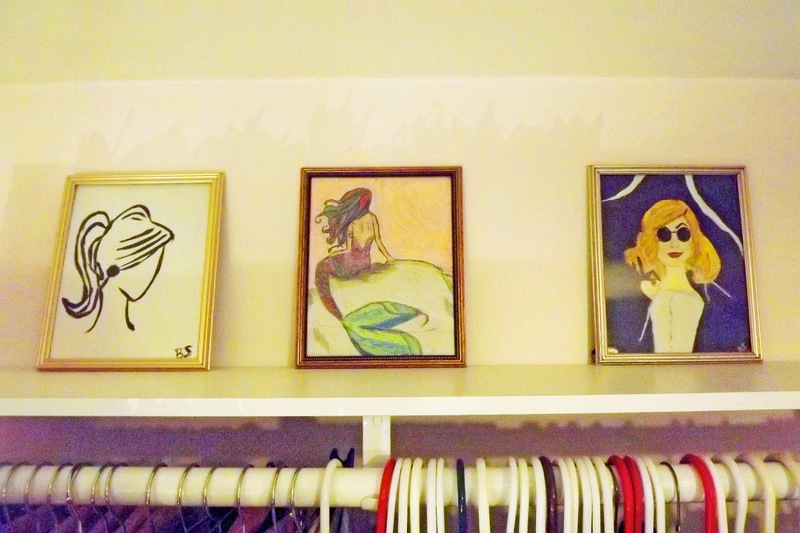 These amazing pieces were done by my super talented sister, and they add so much sass to the room. I love it! 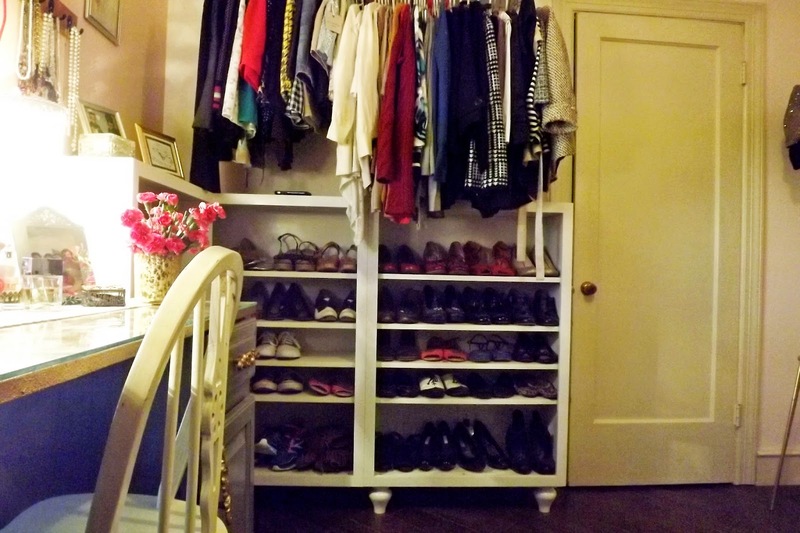 I used another bar and shelf to hold all of my skirts and cardigans or jackets. 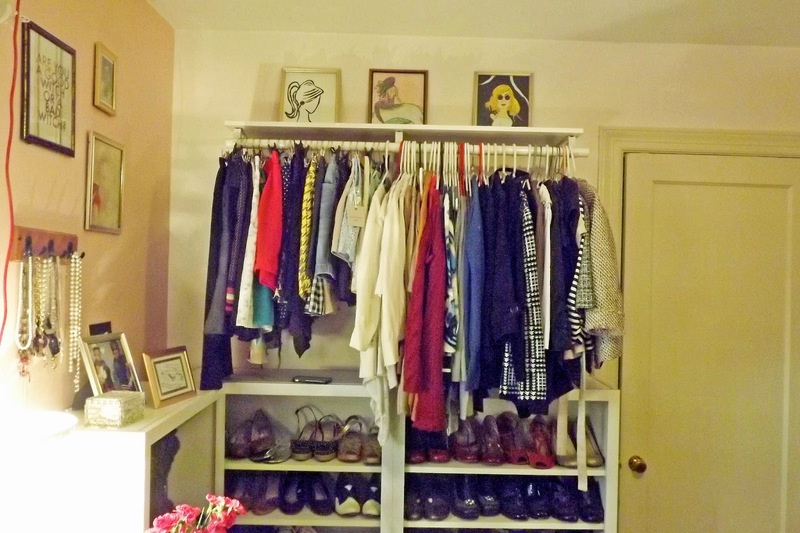 All of my tops are in my closet in the other bedroom. Being able to see the cardigans in color order and the skirts and shorts according to length makes getting ready so quick in the morning! More art from my hubby, painting by my sister, and the indian with the little boy is my father-in-law as a child. I just love this pic. 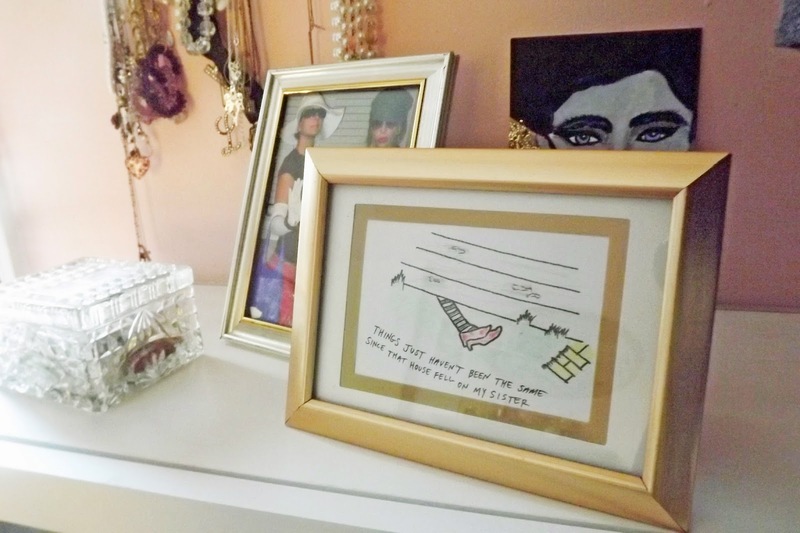 I tied all the art work together by using metallic frames with coordinating colors. 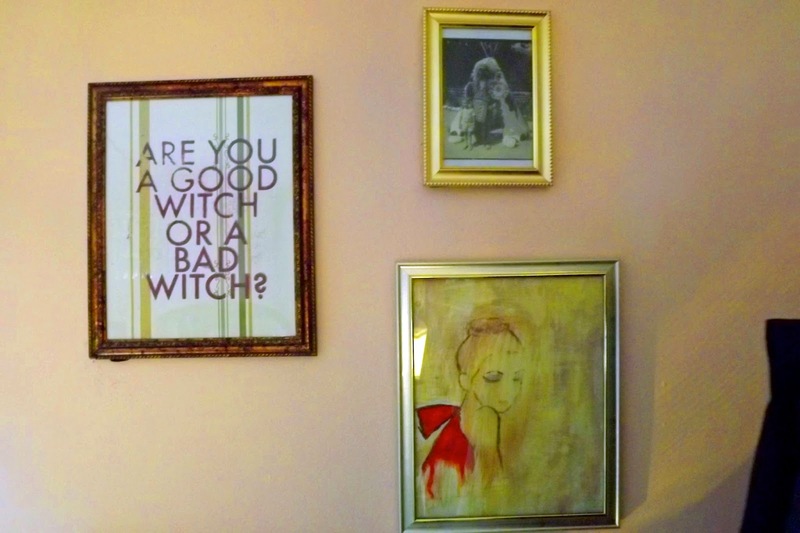 The frames were $1 a piece from the Dollar Tree and gives the room a high class look, without the high price tag. 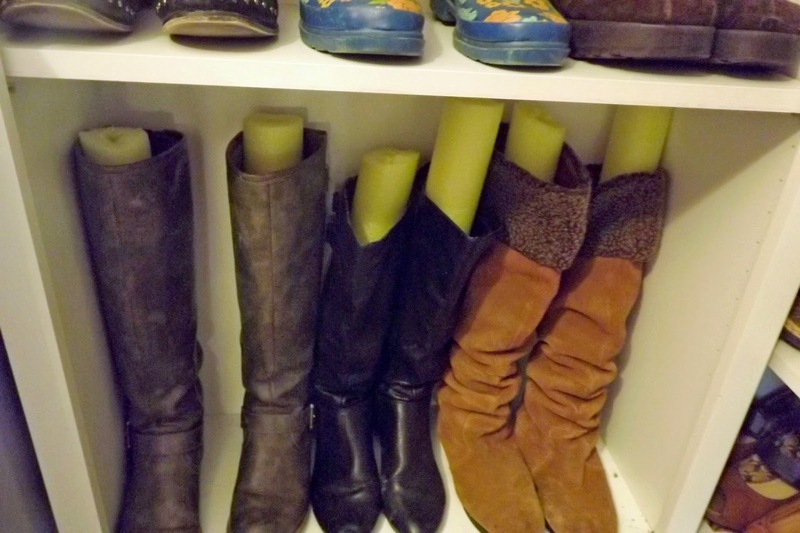 I used the side cabinet to store all of my tall boots, and used $1 pool noodles inside to keep them upright. 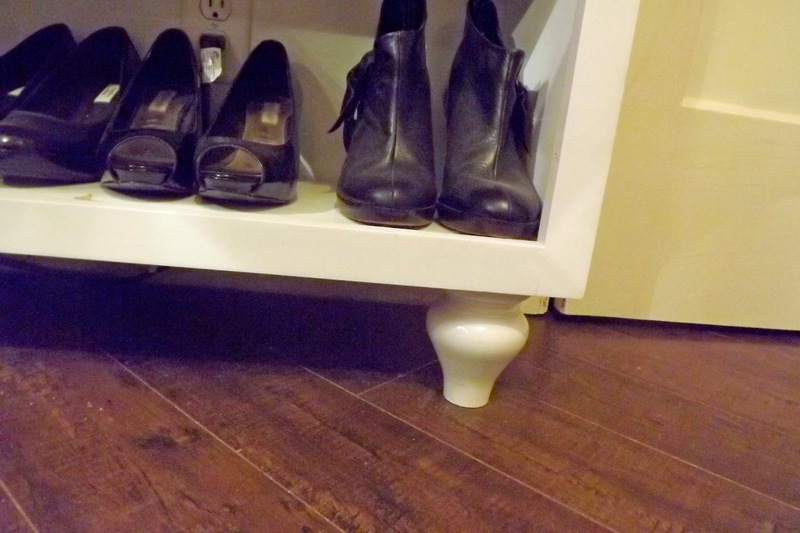 Adding feet to the bottom of a cabinet like this costs next to nothing (nothing in this case) and gives the feel of a fancy piece of furniture, rather than a basic wall cabinet. This light fixture was found in what I call my aunt's basement "store." She was done with it and I knew I had the perfect place to put it! 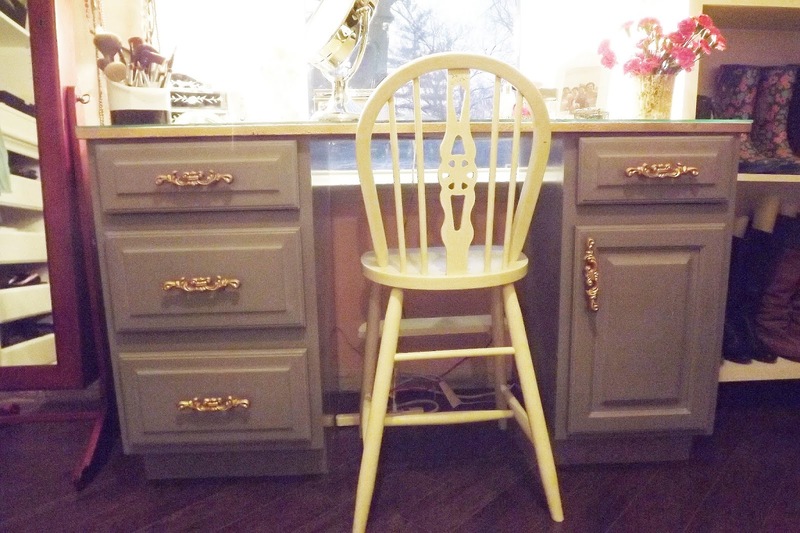 In order to match my vanity and dresser, which used to be in separate rooms, I stained them both using this pretty blue/grey wood color. 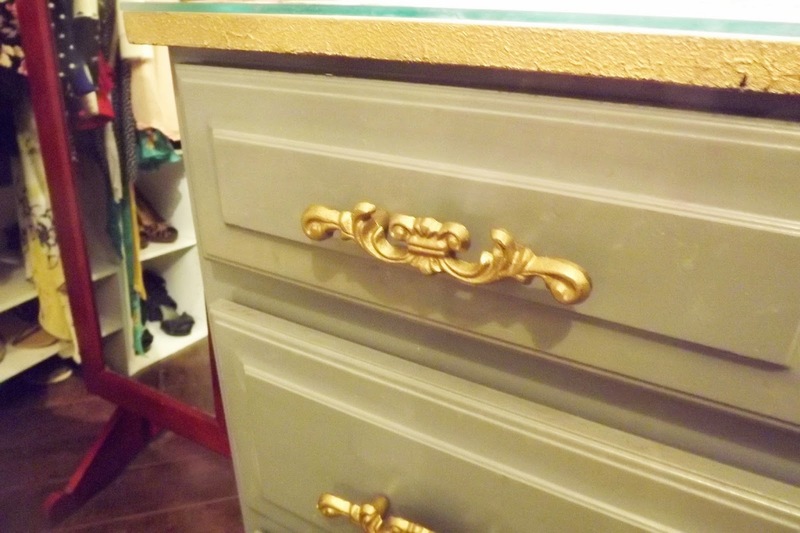 I painted the handles using the same gold spray paint to tie it in to the rooms accent pieces. 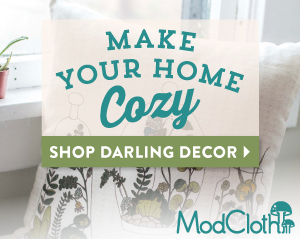 Here are some more details that I just love, and really make this room look pretty, but cozy. 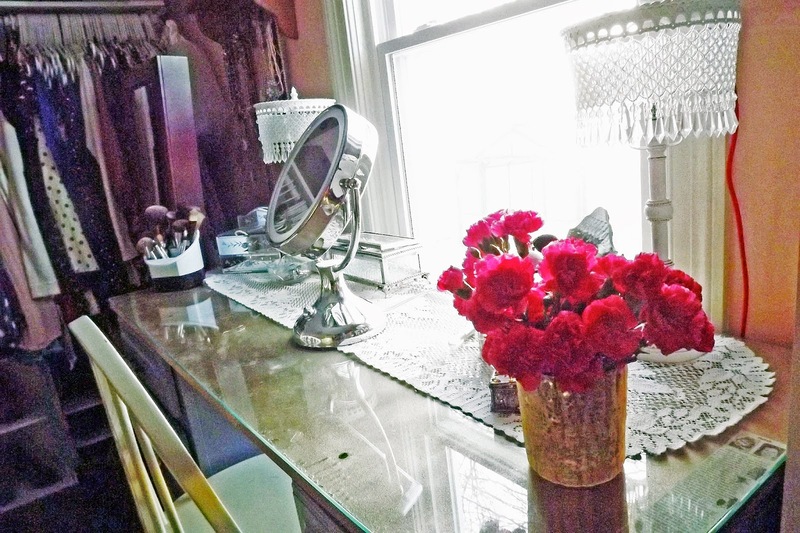 I feel like if there is something you really love, you can always make it work in a room. 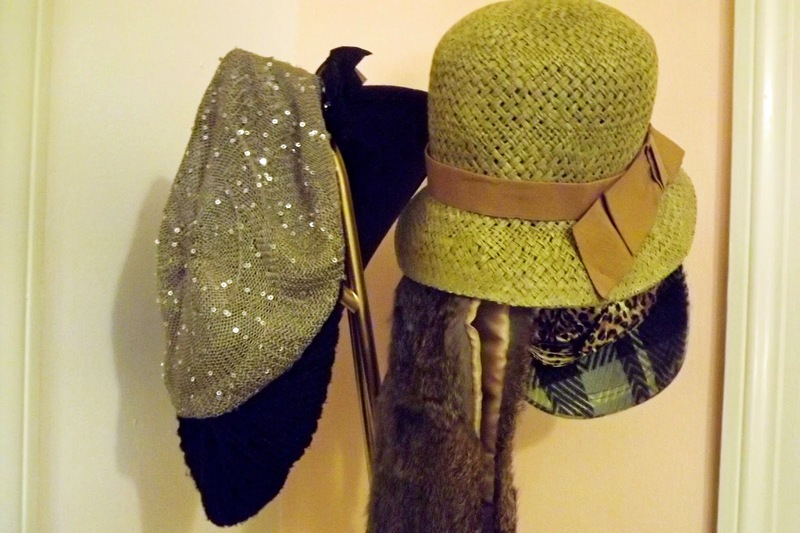 Just pair it with like colors, or as a collection. I think that is why our house feels so super cozy. We pick things that we are drawn to, not just because it matches something. This is my favorite sweater that shrunk. 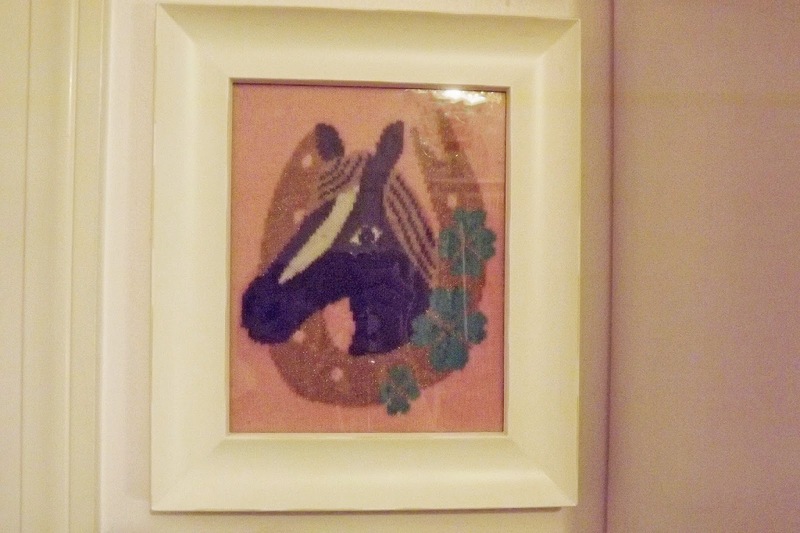 I couldn't get rid of it, so I decided to frame it. That's where my wall color inspiration came from. Turntables are one of my favorite ways to store small groups of things. 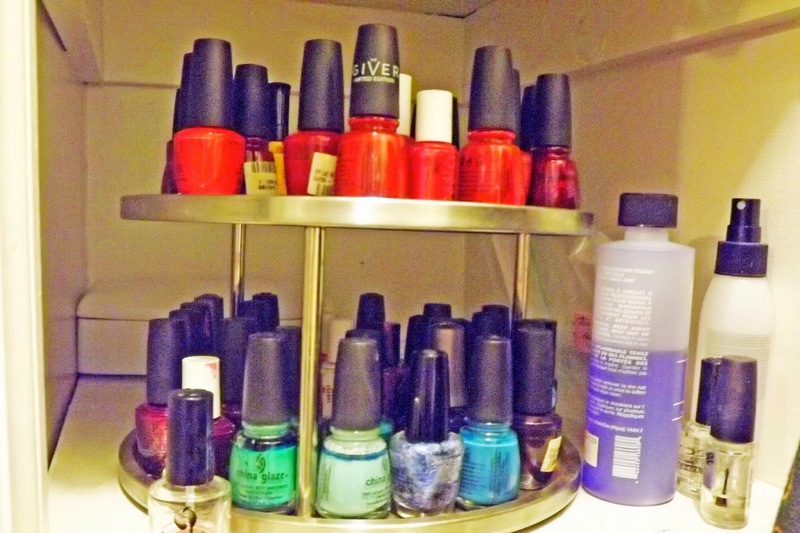 This is my massive collection of nail polishes in my closet. They are in color order to make finding a polish quick and easy. I hope you enjoyed this tour! 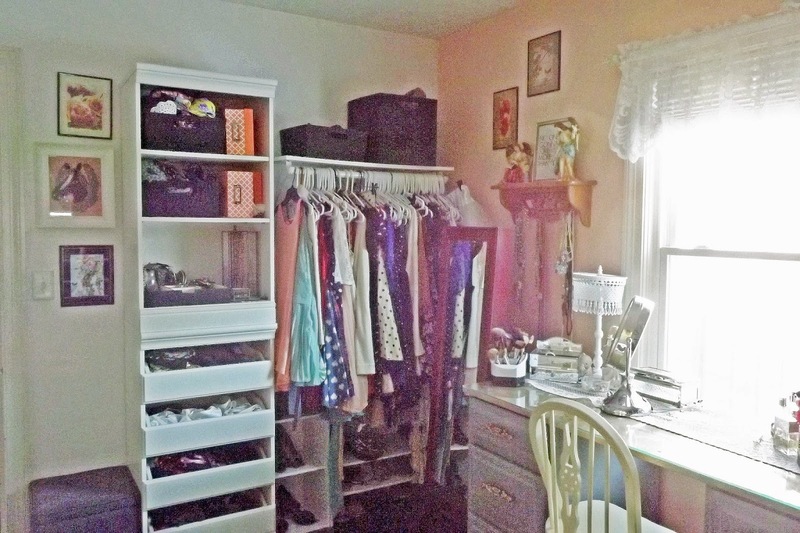 Get creative using things you have on hand to pull together a room that is functional without spending a lot of money, and one that is comfortably YOU!